 Even cats who love going places can have a hard time getting going. 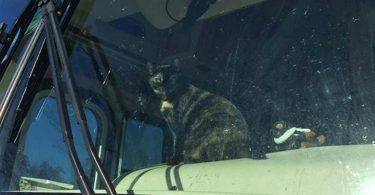 Preparing a cat and getting her out the door is sometimes a little bit like like getting a teenager out of bed on the weekend. She will come right over and check things out, but gets squirmy about the harness and then put in the carrier and shoved in far enough to close the door. It was even worse the other day when I put the harness on her…then realized that I had it upside down. I had to take it off and put it BACK on her. Oh the complaints. She doesn’t put up a fight – she is more than willing to let me put it on. But she has lots of things to tell me about the process. That said, once she is in the carrier and the car and we are off to go places, she is great. She really doesn’t mind being in the carrier in the car. 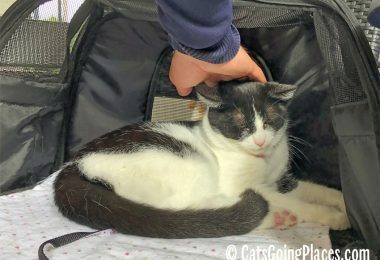 Last weekend we went through the drive through and she sat up in the carrier to see if she could see what everyone was doing inside the Starbucks. She doesn’t mind people coming up and talking to her and petting her. But getting going….she haz complaints. Unlike Chanel, Cupcake doesn’t usually complain aloud about the process of putting her harness on. She just chooses not to help. On one hand, I’m glad she doesn’t struggle against my putting on the harness. On the other, it’s hard to get the harness properly onto a furry mass of jelly. The times she does this have a much higher chance of my making a mistake like buckling her elbow uncomfortably inside the harness instead of getting it tucked behind her elbow because she passively lets me wrap it around her incorrectly. There’s a much higher chance of her pulling the noodle act if I interrupt her napping to begin the routine to go out. Unfortunately, she’s a cat, so she sleeps 18 hours a day. That makes my interrupting her nap very likely except for early morning or evening, times we don’t usually go anywhere. I’m getting a little better at buckling it correctly on her on the first try like this. Or the second. I was worried about this behavior, since cats sitting in their litter can be a sign of a medical problem or of stress. In her case, it was a sign that she didn’t like that I had made a habit of grabbing her up right after she left the litter when she had her harness on. Giving her a moment after she comes out has kept her from doing this again. 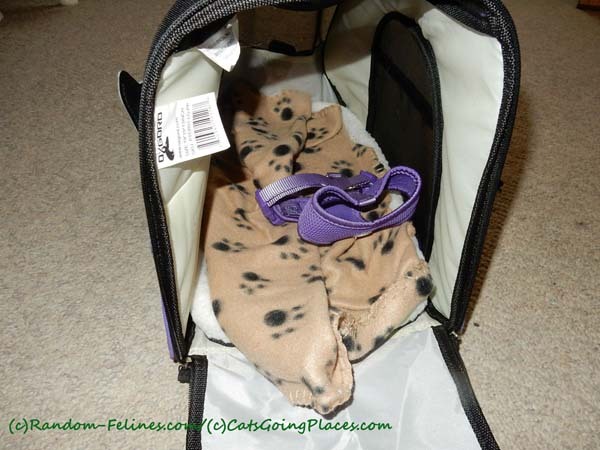 After Cupcake’s litter box visit, I attach her leash and tuck her into her carrier. 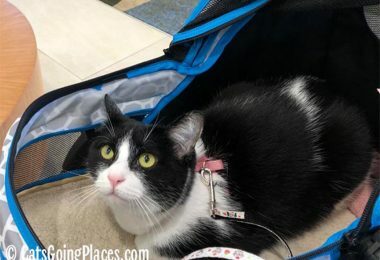 Cupcake doesn’t complain about going into her carrier, but she doesn’t like to sit around in it. Once she is in, she’s ready to go if we are going, and will complain if I haven’t gathered her bag and other necessities ahead of time. Every time Cupcake stages one of these little protests, I ask myself whether she’s telling me she doesn’t like going on outings, since I don’t want to force her into something she doesn’t like. But like Chanel, Cupcake genuinely enjoys being out once she gets there. She loves to interact with the strangers she meets on outings, too. She just needs a little help getting moving, like the teenager she is. MOL! 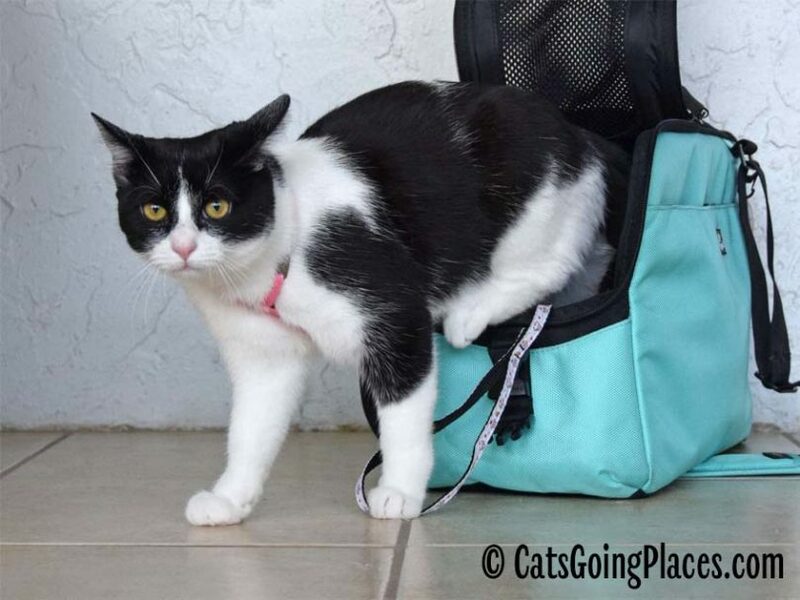 I have always been good about my human putting on the harness… it’s the litter box thing that takes the most time. If I don’t need to go all that bad, I dawdle. 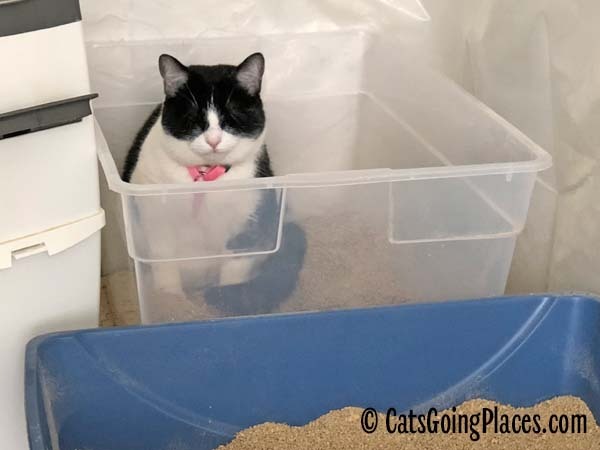 Sometimes I complain about having to use the litter box (my human compares it to a four-year-old complaining and the parent saying, “You’ll be sorry!”). 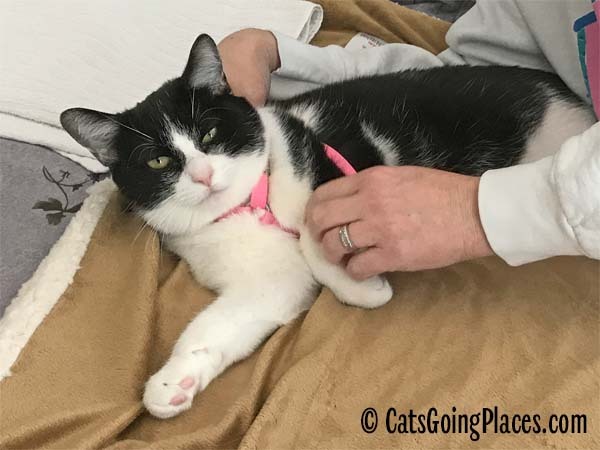 Eventually I’ll go… unless I really, really don’t need to – then I step out of the litter box my human has put me in and walk over to the door. 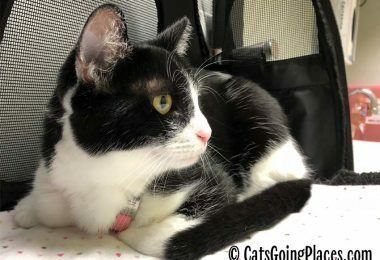 Come to think of it, that’s when I know I’m going on a longer trip – when my human insists that I use the litter box, no matter what! Then I know it is going to be maybe half a day before I see another litter box. Maybe as much as they may like being out, they prefer staying home? That’s a question I ask myself all the time, since Cupcake can’t speak for herself. If Cupcake shows signs she’s “over it” during an outing, we cut it short, and if she showed actual resistance to wearing a harness, I would respect that, too. I think they don’t like the process of getting ready. 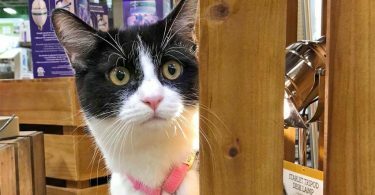 There’s a great video by Sophia Yin about using positive reinforcement to train a kitten to step into a harness. I hope to work on that to see if it will help make the part of the process neither of them seem not to like become rewarding for everyone. Kylo Ren does the same thing. Whenever I get his harness on him, he runs and hides. I’ve questioned whether he doesn’t like his outings, but he genuinely seems to love them once we get going. He doesn’t even mind the car ride. Not a peep. And then when we get out of the car, he is ready to go and could go go go all day long. Like Cupcake and Chanel, he just really doesn’t like the preparation process. I’m taking a class on dog nail trimming that emphasizes training very slow, positive associations. It starts with having an unique and high reward treat but not giving them to the dog (or cat) until the nail file (or harness) makes its appearance first. I know cats have their own mindsets. But if behaviorism works on humans, dogs, chickens, and goldfish, it works for cats too. It might be possible to get the kitties more interested in the harness if they strongly associate it with a delicious and special treat. I remember taking Jack out and about and he would go and sit by the door when he wanted to go on an adventure, it was the coolest thing. I lament that I ended up with a job that prevented me from taking him out as much. Thank you for this article! Rainy is my adventure cat. Like Cupcake, Rainy will run and hide if she sees the stroller or her carrier. I’ve more than once asked if she really likes going with me. Once we’re in the car and then again when we arrive at our destination, Rainy acts as if right at home. This makes me think she does like our adventures. In addition, if too many days pass between outings, she’ll start getting into mischief. Sometimes she’ll even sit by the door or at her carrier. I think like Cupcake, she doesn’t care for the preparation, but really does love her adventures.